Make 16 sonic ideas for each instrument or instrument group. Make 16 pitch ideas for each instrument or instrument group. Link the ideas to the Magic Square either by chance or line them up by feeling. 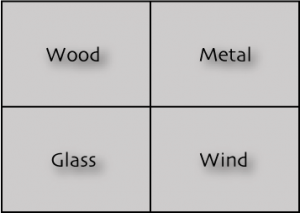 Use sound strategy such as – Wood, glass, wind, and metal. Make a compositional graph in Mind Manager. Work in Mind Manager and do more cleanup. Make a new instrumental chart. Total duration 15 – 21 min.